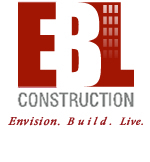 Naples-based EBL Construction, a division of EBL Partners, an established construction and project management firm based in Naples, Florida, has won a 2014 Grand Watermark Award sponsored by BUILDER and Custom Homes magazines. Now in its ninth year, the annual competition honors builders, architects and designers for quality, innovation and excellence in kitchen and bath design. EBL Construction won in the kitchen renovation category for a luxury private residence in the Biltmore at Bay Colony, Naples. Watermark Award winners are selected from an open call for entries and reviewed by a panel of industry experts. Winners are featured in the June 2014 issue of BUILDER magazine, with expanded coverage online at www.BuilderOnline.com and www.CustomHomeOnline.com, and sister publications such as Remodeling, Residential Architect and EcoHome. The winning kitchen, designed by EBL Interiors, features new Kerlite Geoquartz flooring by Cotto d’Este, Snaidero Code cabinetry, Miele appliances, a Liebherr wine cooler, Ceasarstone quartz countertops, Franke faucets and a set of double Farsetti Arte doors. EBL’s signature drop ceiling completed the space.